The basic ingredients are zucchinis, potatoes and chopped tomatoes. But most of us add eggplants or green or red peppers or even both vegetables! Peel and cut the potatoes in large pieces. Cut the eggplant and peppers in large pieces as well. Slice the zucchinis in 1 cm slices. 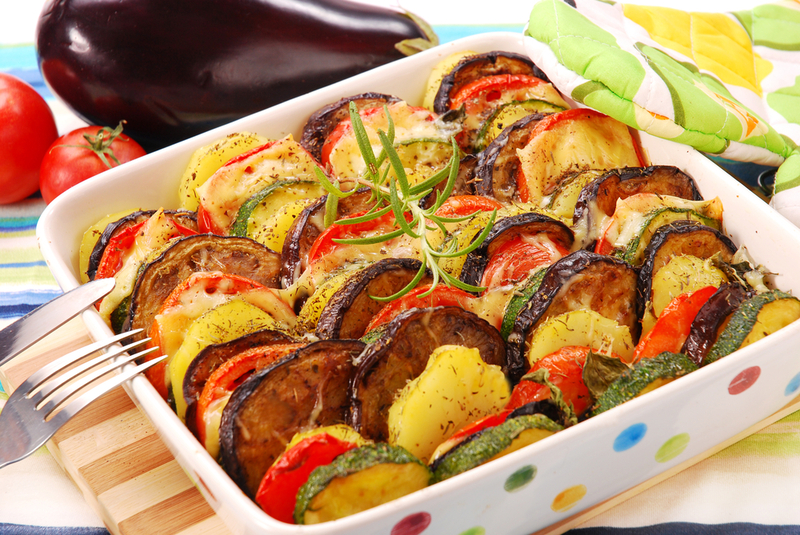 Transfer the vegetable mix to an oven pan, sufficient enough to fit all the vegetables in one layer. Pour some water –about ½ cup will do. Pour more later on if the vegetables become dry. Place in the oven and roast for about 1 – 1 ½ hours. If, in the meantime, the vegetables start turning golden brown cover with a sheet of aluminum foil. Remove the foil when the vegetables are tender and let roast for another 5-10 minutes. Can be served immediately but it’s better to let cool for 30 min and serve with plenty of feta cheese! And some good rosé Greek wine!